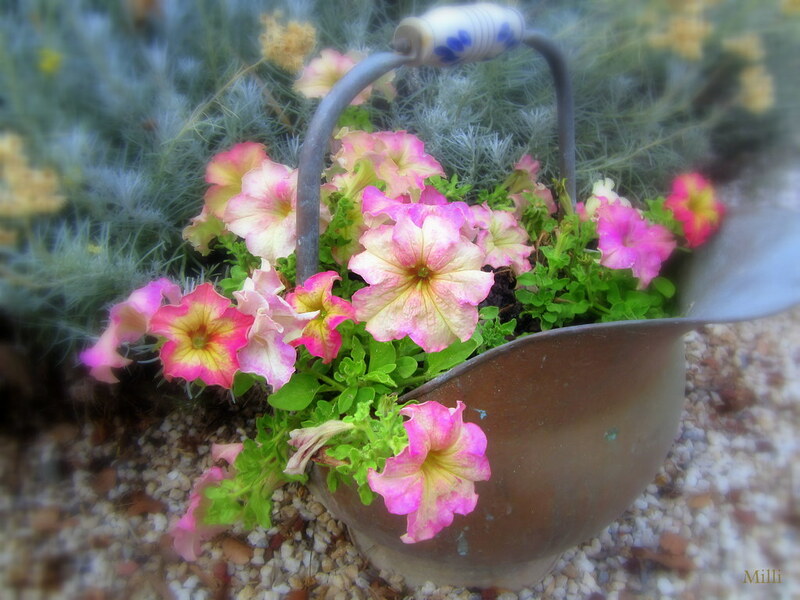 Nostalgia in the form of Old Fashioned Petunias Planted in An Old Pot. When I first read about this theme, kindly presented by our Host Gator, I Immediately knew that my entry would be something that evokes nostalgia within me. From a young girl my nostalgic memories of Summer have always been fondly associated with Pots of Pretty Petunias. I took over the habit of potting up Petunias from my Mother who encouraged us to plant Old fashioned Petunias in Pots for the Summer Months and Old Fashioned Pansies in Pots for the Winter. I hope that you enjoy my photo for this theme. What a lovely tradition, Milli. I can understand that evoking nostalgia in you. I like that old fashioned pot as well. Reminds me of the tradition of buying Poinsettias for Christmas, my grandmother started, years ago. I think of my mother and her, every time I go and buy my seasonal Poinsettia. Russel loves Petunias, they grow all year here, so he is always planting and pruning. Beautiful. Love flowers planted in old pots. Do that when I can. A lovely thing to do, but also a beautiful image, Milli! Plants in old pots look lovely! Pretty Petunias also awake nostalgic nostalgic memories for me. Yours are so wonderful, Milli. The added softness is superb! Oh I love the smell of petunias! I always try to keep them in summer too!